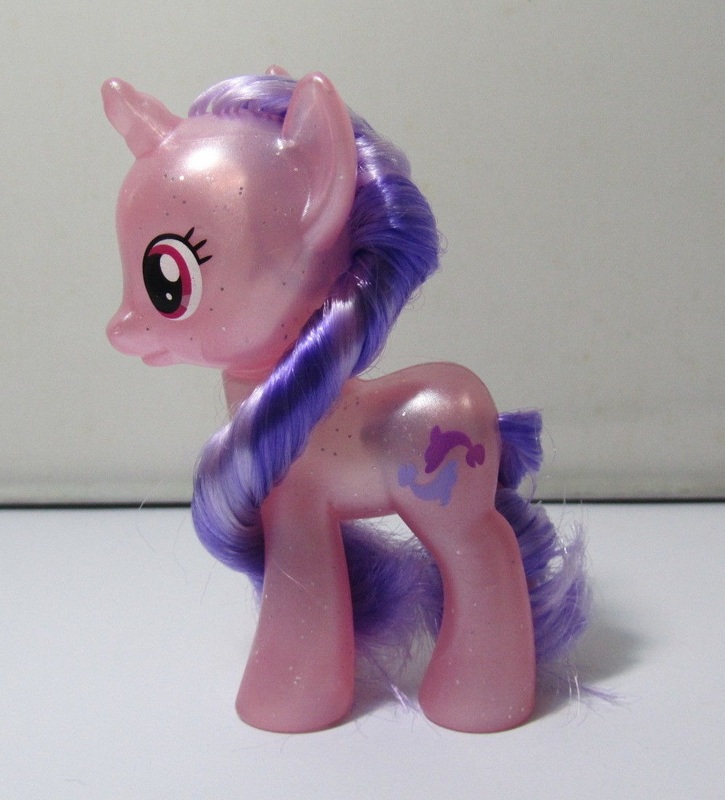 And the last pearlized pony of the 3rd wave of the Pearlized Singles has been spotted on Ebay. As expected it's Sea Swirl and it's the first time that we see her as a brushable. The other ponies from the 3th wave have already been spotted before: Applejack, Meadow Flower and Sapphire Joy. None of these have gotten stock images yet but we'll keep you updated on that as well when they have been found in stores. Explore Equestria Theme Confirmed for Season 6? 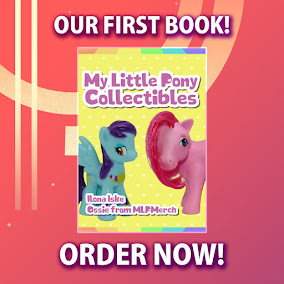 Hasbro has posted this teaser of Season Six on the official MLP Facebook Page. 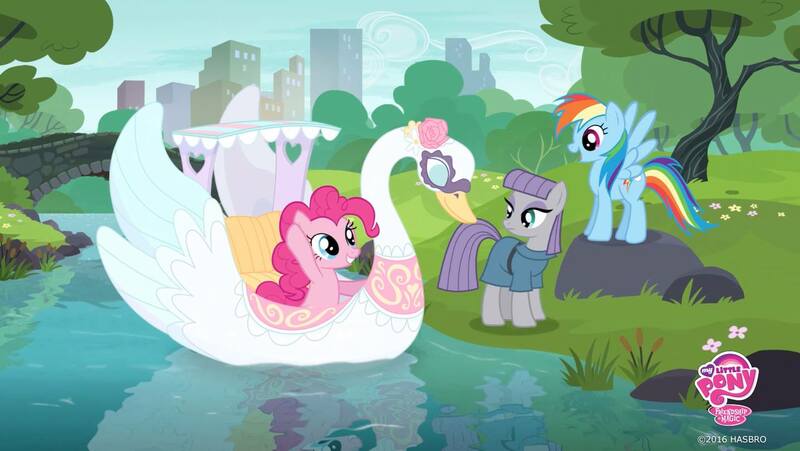 Coming in Season 6: Pinkie Pie will discover that there’s nothing quite as fun as rowing a Swan Boat through Manehattan with best friends!! 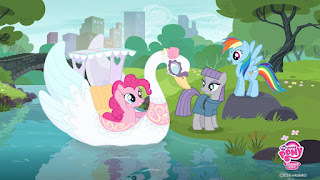 You get to see the city from new and different angles, and it’s a fun way to explore Equestria together!! New Amazon Listings. Possible Wave 13 and 14 Blind Bags? Not long ago we posted a post about some new Blind Bags that appeared on Taobao and some Ebay sellers. (like Sea Swirl Above) Ossie and I both guessed among many other people that this could be the possible 13th Blind Bag wave. So far nothing new right? Well today Amazon decided to list 3 new listing called: My Little Pony Surprise Bag Mini Figure Collection 3, 4 and 5. We only got the standard description so that one's no help. But what about Collection Number one and two? Well according to Amazon. Collection Number one responds to Wave 10, and number two responds to the Wave 11 Blind Bags. I guess Collection three responds to the Wave 12 ones. 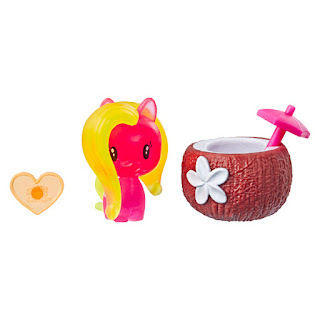 So I guess Amazon has decided to already list the two upcoming Waves of My Little Pony Blind Bags! So far no images or other information yet, so we have to wait. But this means that there will be more Blind Bag Hunting in the future if this is indeed all true. What do you think? New Blind Bags Found! Possible Wave 13? Taobao has sometimes got quite some interesting new things. For example, these Blind Bags were found recently. As you can see there are a lot of transculent Blind Bags with glitter inside their bodies and without painted manes. 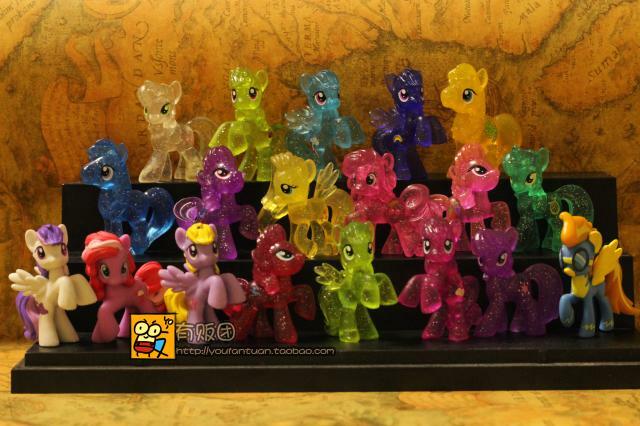 As you can see they also have the official Blind Bag eyes and Cutie Marks. 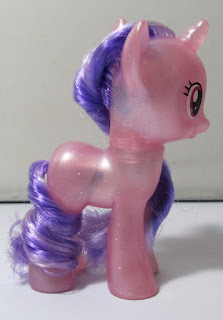 Another interesting thing is that the combination of the body colour and Cutie Mark actually fit the resembled pony! A lot of these have been found so I guess that there's a really high change these will be for wave 13. 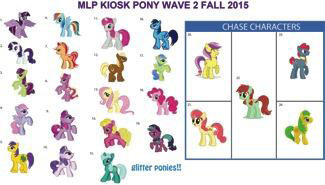 As for now it seems like a lot of the Wave 3 Ponies will be included then. What do you think? A little while ago we made a post about some MLP trading card packs that surfaced and we weren't sure whether they were fake or fan-made. 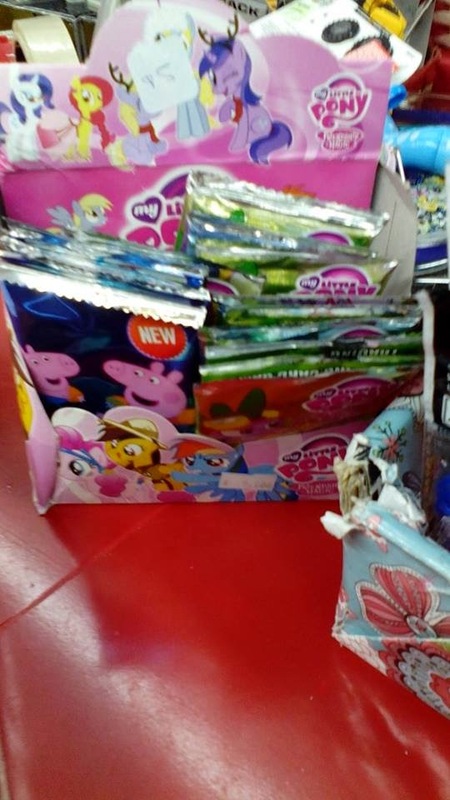 Today this image was found showing that the packs are actually sold in stores, making them bootleg because these are not officially licensed or fan-made. We can also see an actual box for these cards now, showing all kinds of vectors mixed up on the box. There are also some Peppa Pig packs in there containing the same 'New' logo. It seems like the box says that these are 5 Argentinean pesos each, making them an extremely cheap $0.58. The image was taken by WinxClubShines Stella at toystore Nino in Argentina (Also thanks to Lovely Bloom Dash for the info!). We still have to see images of the cards that are inside these packs. If you got one, feel free to send it to us at . It's been a while since we last wrote about OnlyFactory. But it seems like another plushie maker on OnlyFactory is quite busy these days! So are the Filly Princess Celestia and Luna done, as well as Sweetie Drops (Bon Bon) and King Sombra. 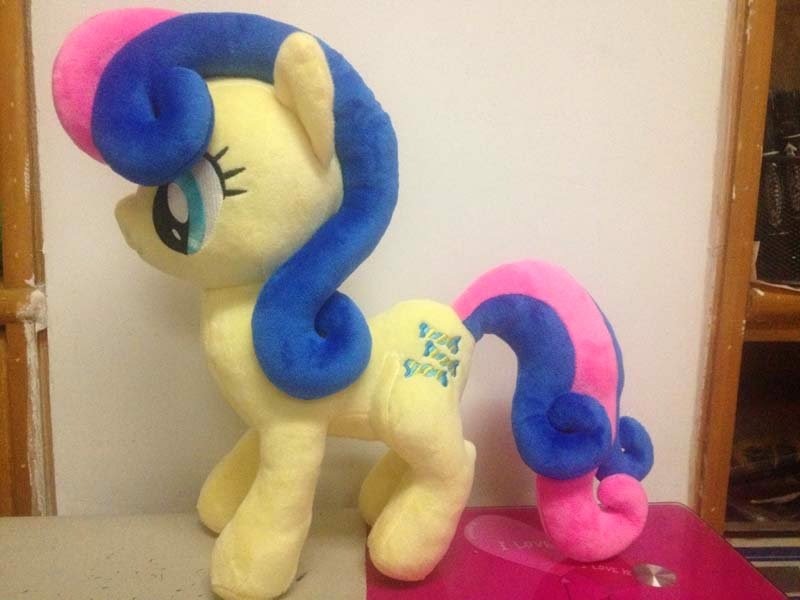 There's also some progress on the Fluttershy Plush with her Gala Dress, and they are working on Maud Pie. 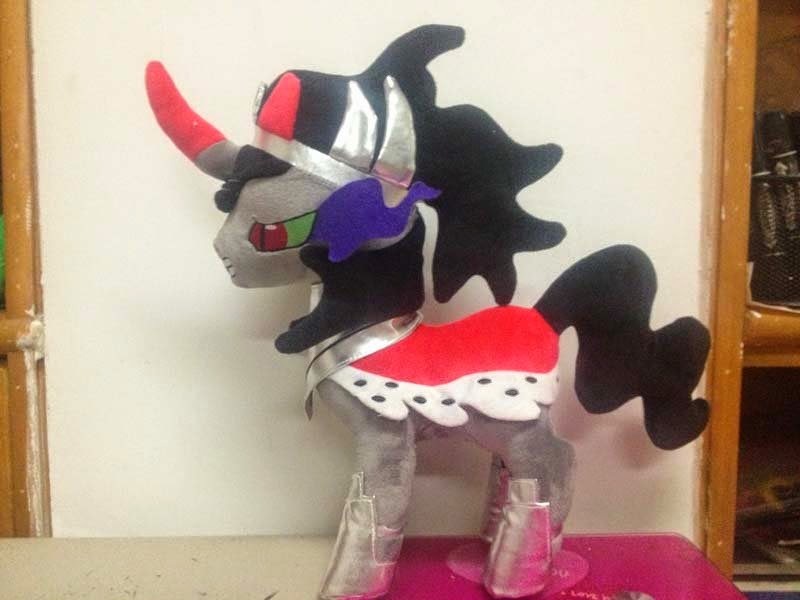 We also collected some new Pony Plush Concept Art from OnlyFactory, you can find all the new (unfinished) plushies under the cut as well as the artwork.